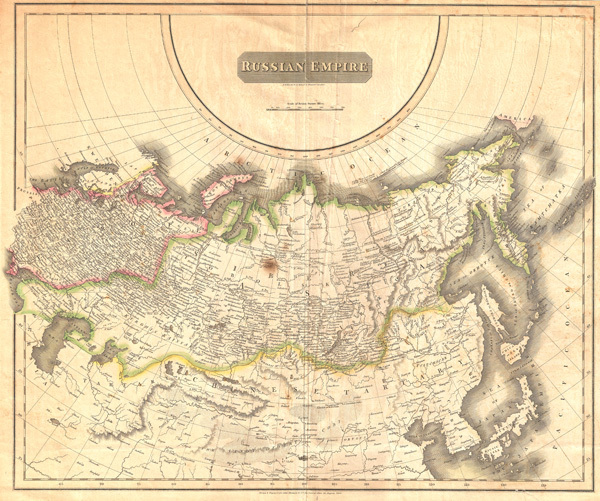 A large 1814 atlas map of the Russian Empire issued for Edinburgh cartographer John Thomson's New General Atlas. Covers the entirety of the Russian Empire both in Europe and in Asia as well as adjacent parts of Tartary, Chinese Tartary, Japan, Korea, and the Gobi. the disputed sea between Korea and Japan is identified as the 'Sea of Japan.' Engraved by N.R. Hewitt, 10 Broad Street, London. Thomson, J., New General Atlas, (London) 1814. Average. Some creasing at center and closed slight tear in lower right quadrant. Discoloration at the center o the map just to the left of the centerfold. Overall all toning and some light soiling.